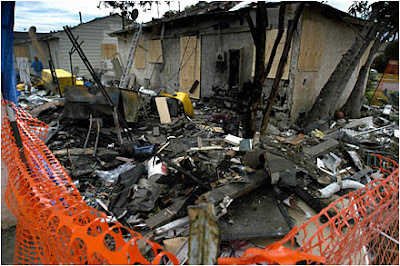 Well hard to believe but March 5, 2007 will be the one year anniversary of the Miller house explosion on Dunrobin Ave in Lakewood CA. What has changed? Nothing really. We had a "fireworks" referendum with one fireworks company spending $40,000 to combat the anti-fireworks money people (which were almost 40% of the vote). We have the same city council today as we did March 5, 2006, which ironically will likely stay the same on the Mach 6, 2007 election the day after the one year anniversary. The only fallout for the utter lack of response to the pre-explosion problems from Miller by the Sheriff's department was for them to be rewarded with a new $20 million dollar station "makeover" (more perks for Deputies) and more overtime pay (likely $100,000) every July 4th to subsidize the cost of increased police presence. Just like at the Federal and State level, everyone shirks responsibility, no one is blamed or held accountable (other than lip service) and things go on as usual. Well LAAG is still working on the fireworks issue along with other cities fighting them. We sort of feel like the anti-smoking people 30 years ago. Few people listened back then but look where they are today. Also, rather ironically, the Miller house on Dunrobin which was virtually destroyed in the March 5, 2006 blast just went up for sale today (March 4, 2007) by the new owner who rebuilt and remodeled the house. It looks great after spending about 300,000 on it. All we can hope is the house is sold to someone who does not use fireworks. 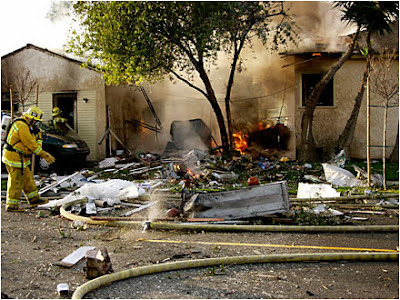 Surely the nearby neighbors who lived through that hell on March 5, 2006 hope so as well. As for Brian Miller he is looking forward to getting out of State prison on or before October 2008, just in time to celebrate the 4th of July in 2009.